Terrorist attacked Israeli soldiers at checkpoint near Tomb of the Patriarchs in Hevron. 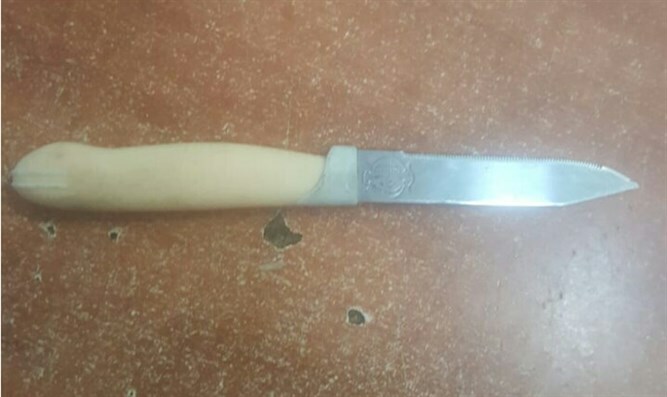 A Palestinian Arab teenager was arrested Sunday afternoon, after she attempted to stab Israeli soldiers with a knife in Hevron, south of Jerusalem. The incident occurred at a checkpoint near the Tomb of the Patriarchs in Hevron, when a female terrorist 17 years of age attempted to enter the holy site while carrying the knife concealed on her person. Israeli Border Police officers operating the checkpoint discovered that the terrorist was armed, and ordered her to comply with their instructions. At that point, the terrorist drew the knife and charged the officers. The officers managed to overpower the terrorist, however, and disarmed her. The terrorist was taken into custody and handed over to the Shin Bet internal security agency for interrogation. Earlier on Sunday, a 19-year-old Israeli soldier was murdered in a terrorist attack in Samaria. The terrorist responsible then took the soldier’s firearm and shot two more Israelis, leaving one in critical condition, the second in serious condition. The terrorist remains at large as of this report.